Pasteles are a singular creation made from common ingredients: root plants stuffed with meat. The meat is usually pork, but it can also be chicken or turkey. At home it’s prepared only on the most special occasions. When I returned home from Vietnam this was the first dish my mother made on honor of my arrival. If you’re traditional you have to use plantain leaves to wrap the thing. If they can’t be found, then wax paper will do. Plantain leaves are abundant in Caribbean and Asian markets. These days they come frozen wrapped in bundles of 12 or more. Believe me, there is a difference between pasteles made with plantain leaves and those wrapped in wax paper. To be honest, preparing <em>pasteles</em> is a pain because it’s so time consuming. A food processor helps. There are still those who prefer to make them the old fashioned way by grating all the ingredients by hand. Among those included my father, of late memory, who disdained <em>pasteles</em> made any other way. Tradition is tradition. I prefer the shortcuts. Either way, pasteles is a project, not a quick fix. But its sublime deliciousness makes it all the worthwhile. Heat oil in a medium skillet and quickly brown pork meat over high heat. In a small frying pan, quickly stir fry salt pork until well browned. Add salt pork to meat; then add ham, olives, capers, tomato sauce and roasted peppers. Cover and cook over low heat for 5 to 6 minutes. Meanwhile, in a large pot, combine chick peas (with their liquid), raisins and olive oil. Add cooked meat and mix well. Season with salt and pepper to taste. Cover and simmer on low heat for 15 minutes. If the meat becomes too dry or liquid evaporates, add ½ cup beef bouillon and continue cooking over medium heat. Using a hand grater or food processor, finely grate the green bananas, yautía, pumpkin, potatoes and plantains. Using a wooden spoon or fork, mix well in a large bowl. In a saucepan or skillet, heat vegetable oil, add annato seeds and sauté on low heat for 5 minutes or until oil attains a medium orange-red color. This is the achiote coloring. Let cool. Strain into a bowl or glass container. Add ½ cup of the achiote coloring to the vegetables. Add salt and mix well. This is the masa or pastel paste. The plantain leaves must be “treated” before using. In Spanish this is known as amortiguar. First, wipe each leaf with a damp cloth. Then with a pot holder or tongs, hold a leaf over a moderate flame, turning leaf slowly until heated but not burned. Smear treated leaves with 1 tablespoon of remaining achiote. Place 2 tablespoons pastel paste in the center and spread it out evenly. Place 2 tablespoons meat filling in the center of the paste (masa). Fold plantain leaf in half lengthwise, and push filling toward the outer folds. Fold in half again. Fold the ends inward. Repeat with additional plantain leaves until filling and paste have been used up. Place two pasteles together, seam side facing each other. Cut about 1 yard of kitchen string. My mother use to measure it by holding the string out from her hand to her shoulder. Place pasteles lengthwise over the string. Fold the string in half. Place the two pasteles on top. Then pull the end of the string around the pasteles and through the loop in the string. 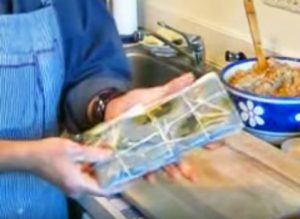 Then pull the string ends in opposite directions, and wrap them around the ends of the pasteles and tie them together in the middle of the other side of the pasteles. Bring 4 quarts water (with 2 tablespoons salt) to boil in a large pot or kettle. Add as many pasteles as will fit comfortably, but with water to cover. This could range from 7 to 8 pasteles. Boil, uncovered, for 1 hour. Remove pasteles and drain. Repeat until all pasteles are done. 10. To serve: place on a platter, cut string and discards. Unwrap pastelesand turn overcarefully into plate. The pastel should retain its shape.